Jon Holloway, a sophomore music education major at the University of Nevada-Reno and a second-year member of the Mandarins, sent this picture. Hi, I'm Jon and this is a picture of the "Holloway Carson Crew" at the 2006 DCI World Championships in Madison, Wis. We are a group of good friends and students who have graduated Carson High School in Carson City, Nev., who were all taught by my dad, Larry Holloway, before he passed away in 2002. 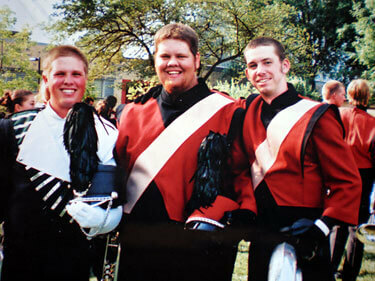 He brought drum corps into all of our lives and I know he'd be proud of all three of us. Pictured is R.J. Sorenson who is now in his fourth season with the Cascades; me in the middle, now in my second season with the Mandarins playing mellophone; and Andrew Chicvara who marched as a contra player in Mandarins for one year.